The NordicTrack Treadmill Desk Platinum is ON SALE! Don’t Sit All Day Long – Get Up and Move! Several fitness equipment brands are coming up with new treadmill desk models, and it only makes sense that NordicTrack release an upgraded model of their own. When compared to the current Treadmill Desk, it has a longer deck surface, stronger motor, incline, and more speed levels. Treadmill desks are growing with popularity every day and there’s good reason! Sitting at a desk job all day long can take a terrible toll on your body. An article in the Washington Post explains how sitting for extended periods of time can lead to colon cancer, heart attacks, muscle degeneration, reduced leg circulation, spinal damage, reduced brain function, and problems with your pancreas. If you simply walk while you work, you can help avoid many of these problems. MID-WEEK SALE ENDS THURSDAY: The NordicTrack Treadmill Desk Platinum is ON SALE for $1,299 with Free Shipping. Financing is available. Related Article – Could Working at a Treadmill Desk Make You Smarter? Adjusts to 10% Incline — This is the main reason we would buy the Platinum model over the regular model. Adding a slight incline to your daily “work-walk” will make a big difference in the effectiveness of your session. Hybrid Walking and Sitting Design — One of the best things about the NordicTrack Treadmill Desks is their ability to function as a walking or a sitting desk. The writing surface can be adjusted up or down 18″ so you can easily adapt the height to fit whichever configuration you’re currently using. This set-up prevents you from needing two entirely separate work surfaces for walking or sitting. 3.0 Continuous Duty HP Motor — This motor is a good size for a running treadmill, so it is more than sufficient for a walking machine. Actually, this model goes up to 8mph, so you can get in a decent running workout if you really want to. The lower priced NordicTrack Treadmill Desk only has a 2.6 CHP for comparison. 18” x 60” Treadbelt —Again, this is a fine length for even a normal running treadmill. NordicTrack has really done a nice job of creating a machine that works for walking-while-working or getting a real workout when you’re ready to sweat! 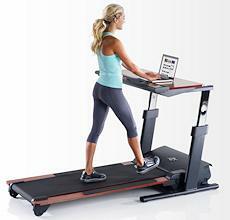 The NordicTrack Treadmill Desk (non-platinum version) has a 20×55″ deck so you have less length, but more elbow room. Just a consideration. 18″ isn’t overly narrow, but 20″ is preferable. Reflex Cushion Deck — This deck has a solid poplar wood base, which is great for propelling you forward with each step. It will help reduce stress on your knees and ankles. Console Built Into Desk —The display on the NordicTrack Treadmill Desk Platinum is a 3 window LCD display that includes information for time, distance, calories, calories per hour, incline and speed. There is also a USB charting station so you can charge your phone or smart device while you work out. The 40×18″ desk surface is attached to a welded steel frame so that it does not experience any vibration from your movement. iFit Coach Ready— Since this machine is iFit Coach Ready, you will be ready right away to take advantage of the iFit Live features including custom workouts, progress tracking, and Google Maps synced workout routes. Click here to learn more about iFit Live. The NordicTrack Treadmill Desk Platinum excels above the competition because it offers both a sitting and walking configuration. You will find other treadmill desks on the market, but may of these have a very cheap treadmill component like you might find sold at Walmart. Here, you have a quality treadmill from a trusted company attached to a very usable desk surface. The Platinum has several features that elevate it above even the regular NordicTrack Treadmill Desk model from NordicTrack. 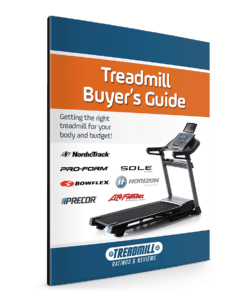 See a complete comparison of all NordicTrack models here. The video above was shot the the NordicTrack/Icon Fitness Headquarters in November 2014. Welp..you sold me. I was on the fence. But I am about to order one now. Wish me luck.